Home > Products > Party Packs! 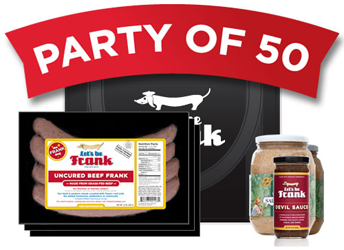 We created our Party Packs to provide everything you need for a Let's be Frank fest at home or on the go in a single convenient, value-priced package. 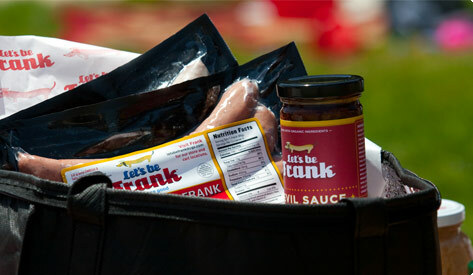 Each pack contains not just franks, but a few of our signature sides of fun, turning an ordinary barbecue extraordinary. Great as gifts, easy for events, brilliant for bashes of all sizes! Three 12 oz packages, mix and match flavors! 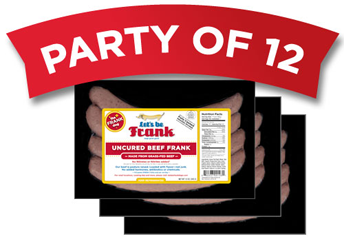 7 packs of dogs, mix and match flavors! 60 dogs, mix and match flavors!